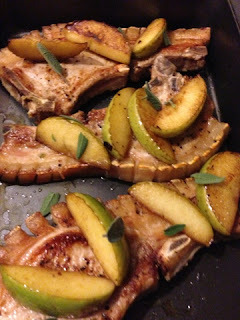 I am a big lover of pork, while this wasn't always so I am driven to finding new ways of enjoying it. 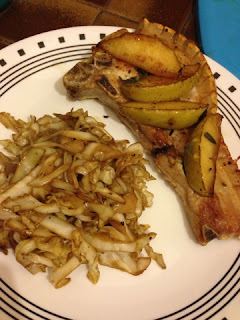 While pork chops are nothing new, and pork and apple (sauce) is nothing new, I have never thought to cook up wedges of apple alongside my pork. Actually do be honest I have a little fear/aversion to eating meat alongside fruit. I am not sure where this has developed from but it's something I am working on. As we finally have a good knife sharpener (thanks Mum) cutting into the rind to make some delicious crackling was a breeze. This was such a simple, easy weeknight meal I might just have to eat it again, very soon. I served this with some braised cabbage tossed in worcestershire sauce, yum. Preheat the oven to 200ºC/400ºF/gas 6. What I like to do is to lay the pork chops out on a board and, using a sharp knife, make 2cm deep cuts all along the fatty side of them. You can ask your butcher to do this for you if you like. It helps to render the fat out and will also make the skin crispy. Sprinkle the chops with salt and pepper. Pour a lug of olive oil into a hot pan. 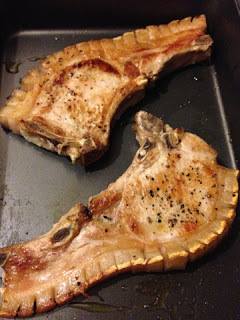 Carefully place your chops in it and cook them for 2 to 3 minutes on each side until golden brown. If you need to, open out the little pieces of fat along the edge so they don't stick together. When the chops are nearly done, lift them out of the pan and put them on to an oiled baking tray. 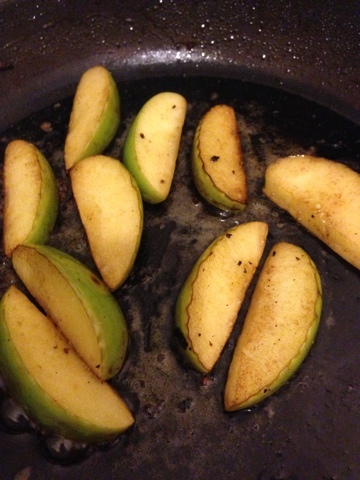 Add the apple wedges and a knob of butter to the pan and fry until lightly golden. Lay 4 wedges of apple on top of each pork chop. Dress your sage leaves in a little olive oil and top each apple stack with them. Sometimes I like to top it all off with a knob of Stilton or Taleggio. Put the baking tray into the oven for 4 to 6 minutes until everything is golden and melted. Changes Made: I did not have any cheese. Results: Yum, the apples still kept some firmness but had that caramelised burnt butter kind of taste which made for some amazing flavours. I also loved that you cook them in the same pan that the port was in as it just intensifies the taste. Next Time: Nothing.. Oddly I find myself saying this an awful lot with Jamie's meals!